An often requested feature is being able to display the media info of the currently playing item while having the Current Playlist displayed as not everyone likes entering the Fullscreen music display as they prefer to see the list of what's coming up within the playlist. To full fill this request I've been playing around with Confluence to see what can be done and as a result I am happy to present a test mod of Confluence which I've called Confluence Music Mod. Note - as I've given this a new addon id it can be installed alongside the normal version of Confluence. If nothing is playing the it is a blank info pane, I've decided if it's best to keep it like that so the View is always there even when nothing is playing, or I could hide the View if nothing is currently playing. In addition this view is not just restricted to the Current playlist view, it is available to see when browsing throughout the music nodes. Another design decision was when in the Now playing view the info that would normally appear at the bottom has been hidden, as this view should make that redundant, however I've left it there for all the existing views. Thanks for doing this most helpful, this view has been needed for years, is it likely that it would be merged into the standard confluence skin at some point in the future ? I asked @Hitcher to take a look as I wanted both user and his feedback before going to the trouble of raising a PR. Thanks for this. Since the default skin for Leia is now Estuary, will it also work that skin? Personally I use Estuary Mod by pkscout because it's not overloaded yet more customizable than the default flavor. It is purely a Confluence Mod since it's Confluence I still mainly use. Doing a similar Mod for Estuary shouldn't be too difficult so I can certainly take a look if people would find it useful. PR was raised and accepted into Confluence so the new Now Playing view should be available whenever the next Confluence update is pushed. I will now look into something similar for Estuary, however with Estuary it will have to done in stages as there’s a lot more work to do. (2018-10-17, 20:18)jjd-uk Wrote: I will now look into something similar for Estuary, however with Estuary it will have to done in stages as there’s a lot more work to do. On this general topic I am interested in opinions concerning using the visualization window "info" Player.ShowInfo vice the SongInformation dialog. 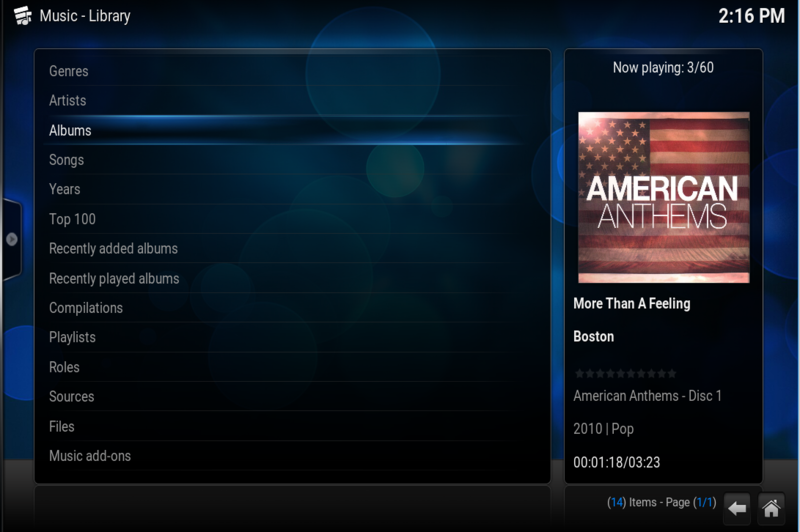 Umm, I have a mod of Estuary which works with my streaming radio helper (well, I would have wouldn't I !!). 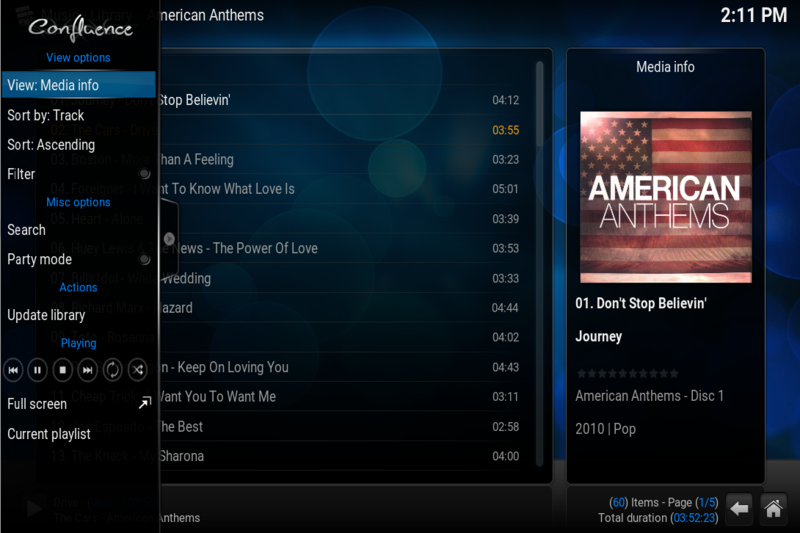 It's based off pkscout's mod but adds support for streaming radio. It needs script.skin.helper.service for fake CDArt in the event that no local cdart is available in your music directory. If this isn't installed, the skin will fall back to a blank CD. 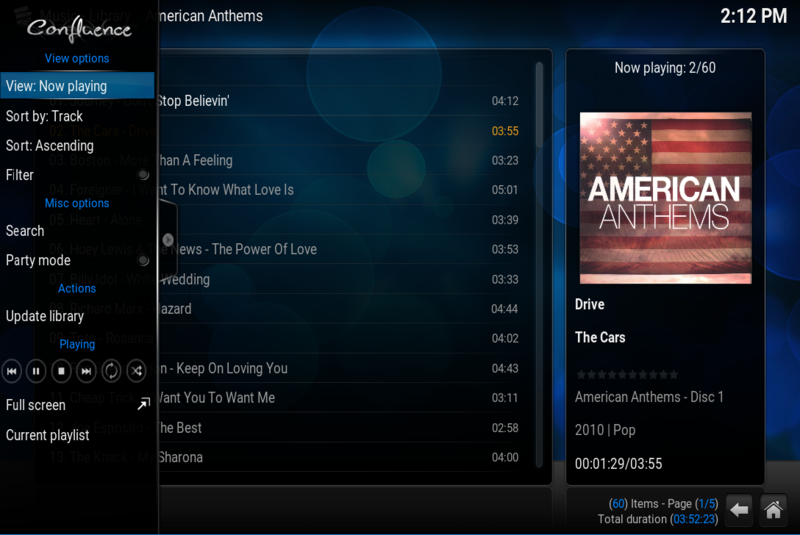 Streaming radio helper can be downloaded from my repo(for Kodi V16/17) or from https://github.com/the-black-eagle/scrip...ing.helper - NOTE : You need the development branch for Kodi V18 currently. The skin will use local art if it exists (folder.jpg/cover.png and cdart.png) in preference to using online art. The aim is to get it to look as near as possible to what's available when you play a local track (although I'm aware that stock Estuary does not display logos or banners). Learning Linux the hard way !! (2018-10-21, 00:15)scott967 Wrote: On this general topic I am interested in opinions concerning using the visualization window "info" Player.ShowInfo vice the SongInformation dialog. On the music visualization window, the user can use the <i>nfo key to toggle a boolean. Skin can use this boolean to create what amounts to an overlay in the context of the viz window. This overlay can provide any infolabels / art about the current playing item. Alternatively, user can open the "now playing" window (musicplaylist). On musicplaylist user can then open the songinformation dialog using <i>nfo key. 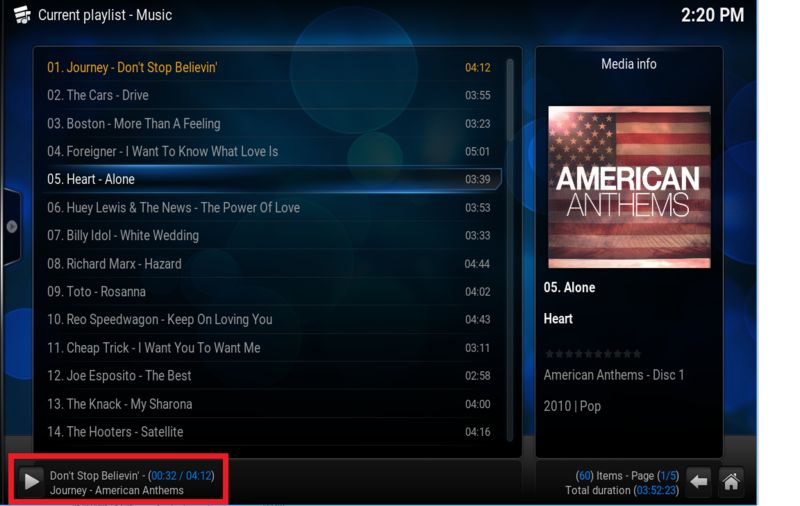 Songinformation can show both the player infolabels/art (these are global) as well as "listitem" infolabels/art from the context of the musicplaylist window (the focus item in the media container). So skinner has two options to show now playing info to the user, depending on the path to info user takes. My question is how skinner can take advantage of the two options, maybe showing different information in each. Currently in Aeon MQ5 (and I think also subsequent versions) music viz window has some stuff that is always shown (art and artist slideshow properties) and music viz <i>nfo isn't used. So I think it could be useful to do something in viz <i>nfo. 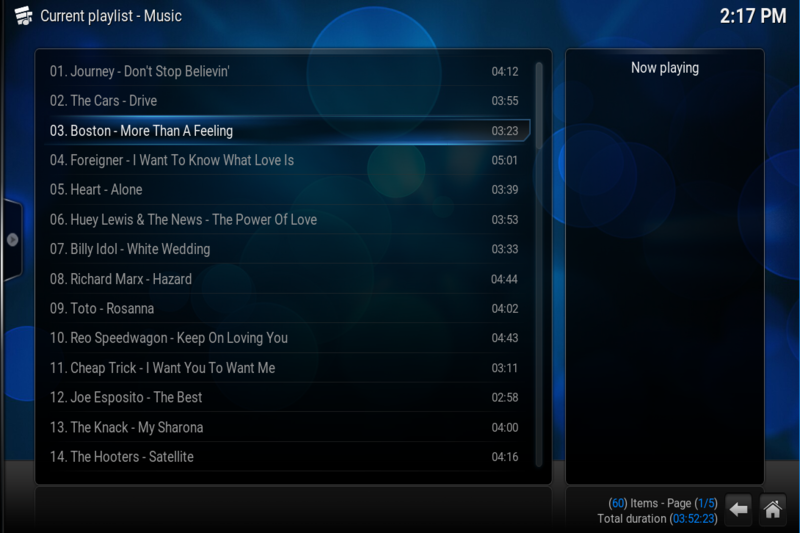 But maybe not just duplicate what can be obtained in the musicplaylist songinformation dialog.